H&S Environmental, LLC provides in-field and desk-top evaluations of lagoon system performance to get your system in compliance and functioning at optimum treatment efficiency. 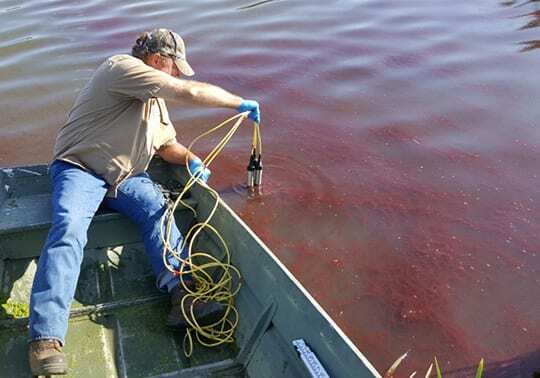 In-field evaluations entail sludge judging, measuring ammonia, nitrate, nitrite, alkalinity, and performing dissolved oxygen, pH, and temperature profiles spacially across each treatment cell. For this type of evaluation, we enter each cell and measure water characteristics at 1-foot increments through the water column and between each cell. We track historical performance back four (4) or more years and perform statistical analysis on DMR and system data sets to find correlations leading to the direction optimization and or troubleshooting should take. Field data and historical data are then combined to understand why things are happening in the system, where things are happening, and when it is happening. In this way, we can pinpoint the source of the problem or find the place to focus optimization efforts to meet treatment objectives. This data is used to create a report with recommendations for optimization and or troubleshooting based on the facts of historical and field-measured water quality results. Our goal is to get the most out of the lagoon system you are currently using. Call us now to let us know how we can best serve you. © 2018, H&S Environmental, LLC. All Rights Reserved.